Combining a Balmain Double Breasted Wool Felt Blazer with light blue ripped boyfriend jeans is an amazing choice for a casual yet incredibly chic outfit. Our favorite of an infinite number of ways to complete this look is a pair of tobacco leather ballerina shoes. This combination of a Balmain Double Breasted Wool Felt Blazer from LUISAVIAROMA and black flare pants is on the casual side yet it's also incredibly chic and put-together. Why not take a more relaxed approach with footwear and complete your ensemble with charcoal athletic shoes? Breathe personality into your day-to-day casual wardrobe with a Balmain Double Breasted Wool Felt Blazer from LUISAVIAROMA and navy ripped skinny jeans. A pair of black leather ballerina shoes serves as the glue that will bring this look together. A Balmain Double Breasted Wool Felt Blazer and black leggings will add serious style to your daily casual arsenal. If it's comfort and functionality that you appreciate in an ensemble, consider teaming a black double breasted blazer with olive camouflage skinny jeans. 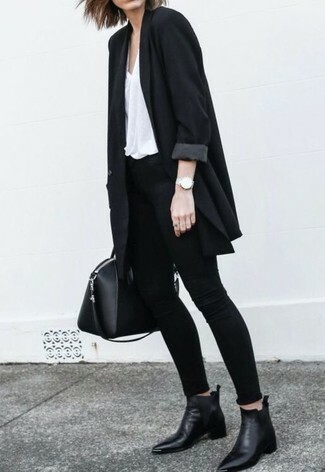 If you want to easily dial down this getup with one piece, why not add black and white low top sneakers to the equation? This pairing of a Balmain black double breasted blazer and black skinny pants is extremely easy to put together and so comfortable to rock all day long as well! Complete your ensemble with black and white leather loafers and the whole look will come together perfectly. This casual combo of a black double breasted blazer and a blue maxi dress is a solid bet when you need to look good but have no extra time to assemble an outfit. A Balmain Double Breasted Wool Felt Blazer and light blue ripped skinny jeans are the ideal way to introduce some cool into your current casual repertoire. When it comes to shoes, go for something on the relaxed end of the spectrum and finish off this outfit with gold leather flat sandals. 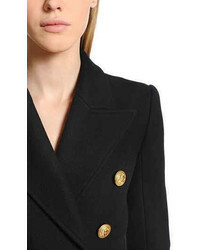 A Balmain Double Breasted Wool Felt Blazer and black skinny jeans are the kind of a tested casual outfit that you so awfully need when you have zero time. Go ahead and complete this ensemble with a pair of black leather chelsea boots for a dash of casualness.